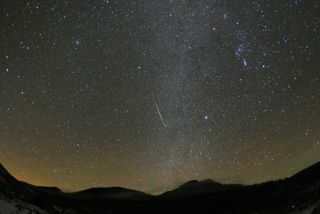 The annual Draconid meteor shower will hit its peak Saturday (Oct. 8), but skywatchers may not get much of a light show. While the normally tame Draconid meteor shower will be exceptionally active this year, the fireworks should be drowned out by sunlight in North America and a bright moon in Europe and Asia, experts say. So stargazers under dark skies may still want to look up on Saturday, but they shouldn't let their hopes get too high. Like other meteor showers, the Draconids — so named because they appear to radiate from the constellation Draco — result when Earth plows through debris streams shed by a comet on its path around the sun. These comet bits become meteors, or shooting stars, when they burn up in Earth's atmosphere. In the Draconids' case, the parent comet is called Giacobini-Zinner, so the Draconids are also known by another name: the Giacobinid meteor shower. Most years, the Draconids are weak and faint, with peak meteor rates of about 10 per hour. That's barely above the normal background rate of shooting stars, and a far cry from consistently dramatic showers like August's Perseid meteor shower display. But this year, Earth will encounter especially thick cometary debris streams, revving up the Draconids considerably. "Rates are projected to be 500 to 1,000 per hour," on Oct. 8, Cooke told SPACE.com in an email. Unfortunately, the shower should peak around 1 p.m. or 2 p.m. EDT (1700 or 1800 GMT), meaning the sun's glare will wash it out in the Western Hemisphere. Stargazers on the other side of the world will at least have dark skies during the Draconids' peak. But conditions will be far from ideal in the Eastern Hemisphere, Cooke said, because the moon will be about 90 percent full on Oct. 8. "The moonlight is going to wash out most of the meteors," he said. Some of the best places to watch the Draconids this year are spots around the Mediterranean or the Middle East, he added. These regions will likely have clear skies, while Northern Europe tends to be cloudy at this time of year. "But don't go if you're expecting to see lots of meteors, because the Draconids are faint, and that full moon will disappoint you," Cooke said.